Ryanair Holdings Plc reported an 8 per cent drop in third-quarter earnings and said it’s “cautious” about meeting full-year targets as a capacity glut and stuttering economies cause fares to tumble. Profit after tax fell to 95 million euros ($102 million, Dh374.3 million) in the three months ended December 31 from 103 million euros a year earlier, Dublin-based Ryanair said in a statement Monday. Analysts had predicted that the figure would be barely changed at 102 million euros, based on eight estimates. Europe’s biggest low-cost airline saw prices tumble 17 per cent in the quarter as it sought to undercut rivals, and said that trend is set to continue. While 12-month profit should still be in the range of 1.3 billion euros to 1.35 billion euros, the company said it can’t be more specific and that any “security events” impacting near-term bookings could cause it to fall short. Shares of Ryanair traded 1 per cent lower at 14.62 euros as of 8:05 am in Dublin. They’re virtually unchanged this year, valuing the company at almost 17.9 billion euros. The winter decline in ticket prices was steeper than the 13 to 15 per cent previously forecast, though the reductions helped lift Ryanair’s passenger tally 16 per cent so that its load factor reached a record 95 per cent. Fourth-quarter yields will decline as much as 15 per cent and fares will remain “challenging” into fiscal 2018, the company said, with rivals that have quit Egypt and Tunisia following terror attacks there saturating the market in Portugal, Spain and Italy, according to Sorohan. Gerald Khoo, an analyst at Liberum in London, said in a note that while Ryanair’s third-quarter profit had fallen short, the carrier’s low cost base means its competitors face “greater pressure” from the fare decline. 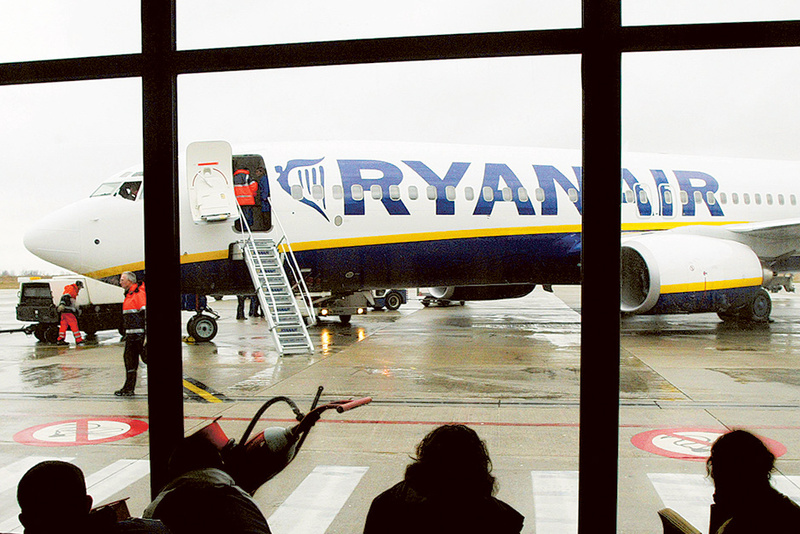 Ryanair reiterated that it expects to grow more slowly in the UK than it once planned following the country’s June 23 vote to quit the European Union. The company shaved 75 million euros from its profit target in October as the pound fell against the euro in the wake of the referendum result, reducing the value of sterling receipts translated into the single currency. There could still be deals at individual airports like one last month that will see the operation of nine new routes from London Stansted, its biggest base. Ryanair’s fuel costs fell 20 per cent per passenger in the third quarter and a further saving of about 65 million euros is expected for fiscal 2018, with the carrier 85 per cent hedged at $49 a barrel. EasyJet Plc, Wizz Air and Deutsche Lufthansa AG have also said that they see the rising oil price doing little to arrest the fall in fares, given hedging positions. The Irish company lifted its full-year target for unit cost cuts to 4 per cent from 3 per cent. Sorahan told Bloomberg Television it’s continuing to work on plans to provide feeder traffic to Norwegian Air Shuttle ASA flights and that an agreement should be reached by the summer. A similar accord is under discussion with Italy’s Alitalia SpA.